I usually regard vintage bicycle components as superior to their modern day mass-produced peers. The quality materials, excellent machining, and innovative designs of vintage parts usually simply overwhelm their contemporary competitors. 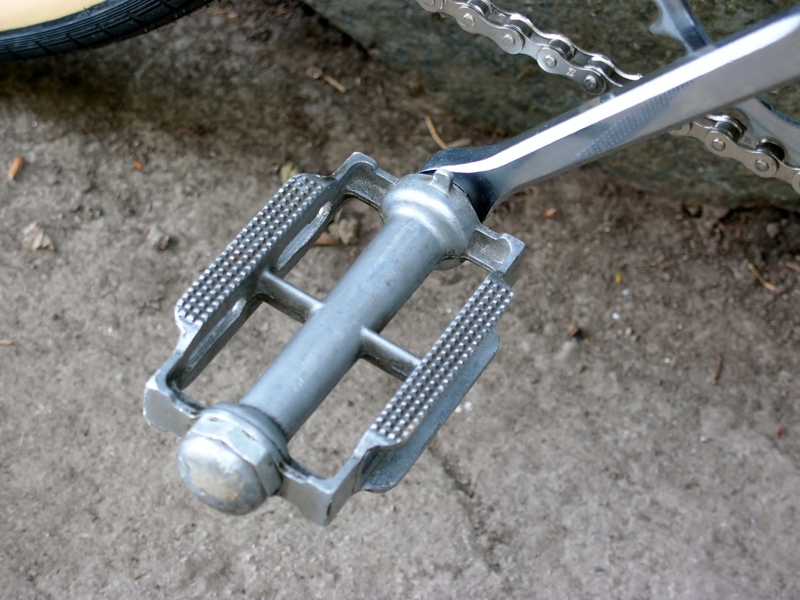 The above pedal is a good example. This 1946 Peugeot pedal has a beautifully machined tapered spindle, with the Peugeot marque incorporated into the pedal cage. You definitely will not find this attention to detail in any modern pedal. 1950 Raleigh pedal with clever lockring which engages the cone. There are really two aspects to a pedal’s design: the shape and construction of the cage, and the design of the spindle, cones, and bearings. 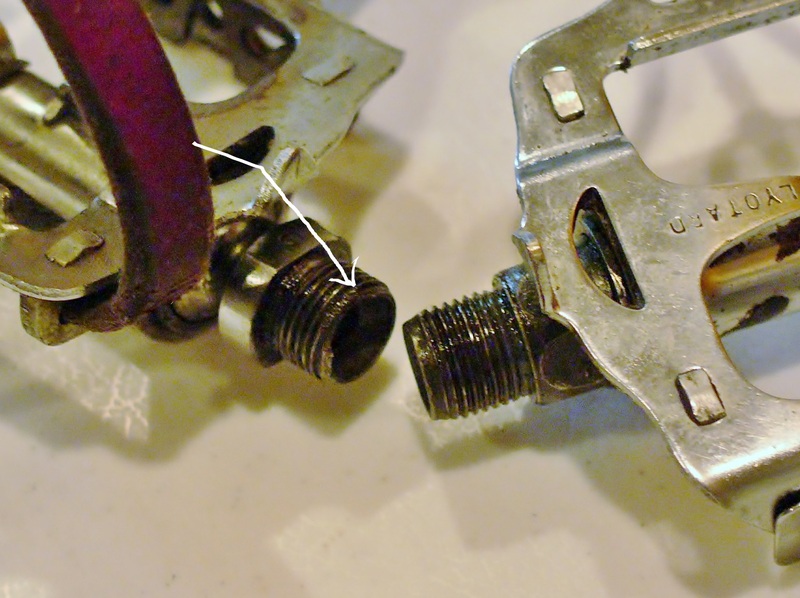 Many modern pedals are not rebuild-able, so if they fail you have to throw them away. Vintage pedals were never designed to be thrown out. They are designed to last through the ages, with adjustable cups and cones and replaceable bearings. 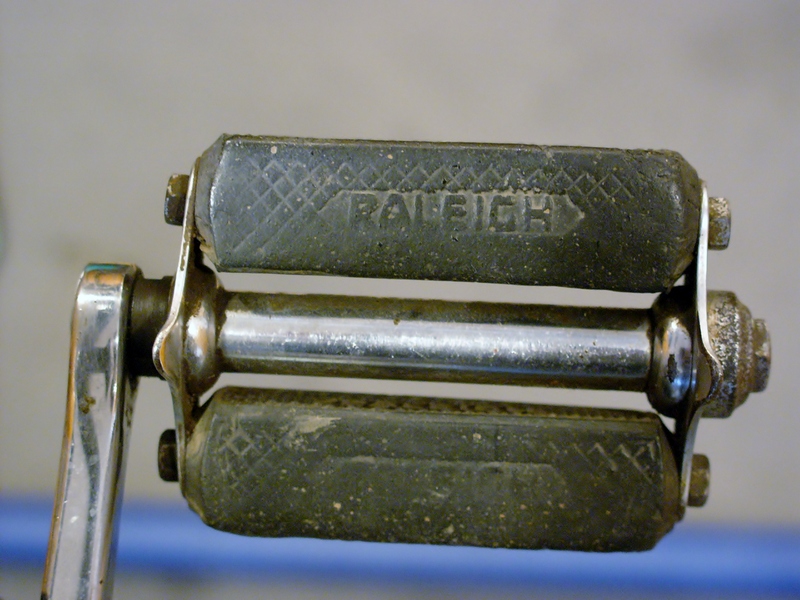 The pedals on my 1950 Raleigh Sports Tourist reflect a real commitment to pedal maintenance: the lock ring has notches which engage with the cone, so that pedal adjustment is fast and easy. Weight of a pedal can also be a factor. This 1947 Aluvac Pedal is lighter than any other pedal in my collection! The weight of a component can be a consideration when choosing parts for a build, but in this case, the extremely lightweight pedal pictured above was part of a 1947 Peugeot Mixte. A bike one would not think of as giving homage to the weight weenie gods. 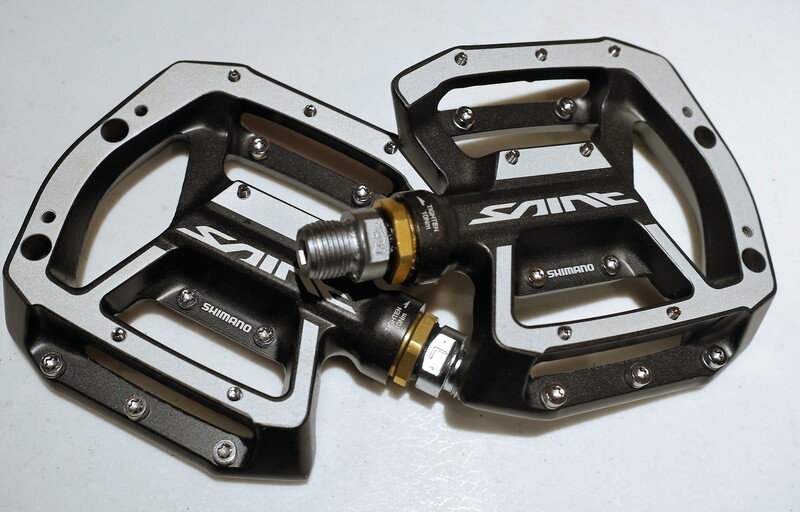 Recently I have changed out some of the pedals on the bikes I regularly ride for these Shimano Saint Pedals, which I reviewed a while back. These pedals are totally rebuildable, and offer a large and comfortable platform for one’s foot. They feature adjustable pins which lock your shoe into position. For me, someone who rides in rainy, urban conditions, these pins work really well. They are a great alternative to clipless or toe clip pedals, since they really do lock your feet in place, even when weather conditions are bad. The shape of the pedal platform, along with the adjustable pins, make these pedals far more useful than most platform pedals I have used. Marcel Berthet pedals – 1953 vs. 1973. 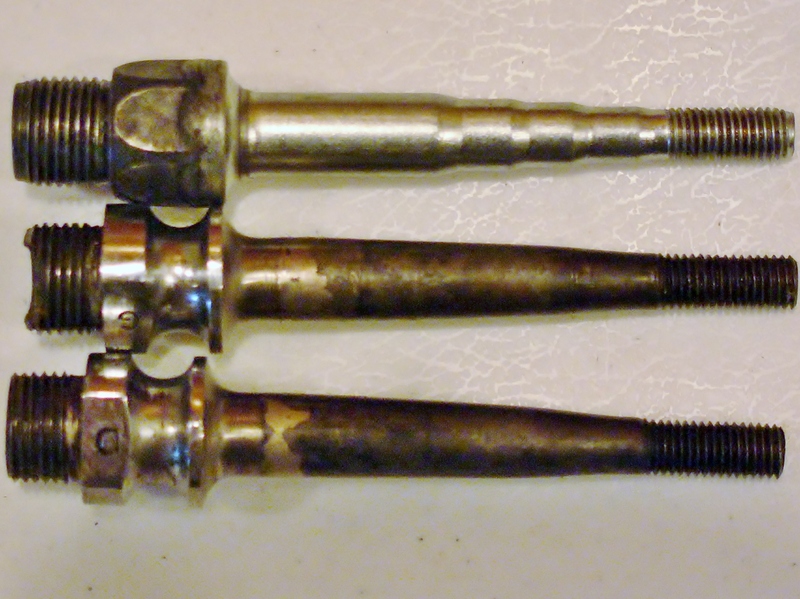 A while back, I had a component failure on some 1953 Marcel Berthet pedals. 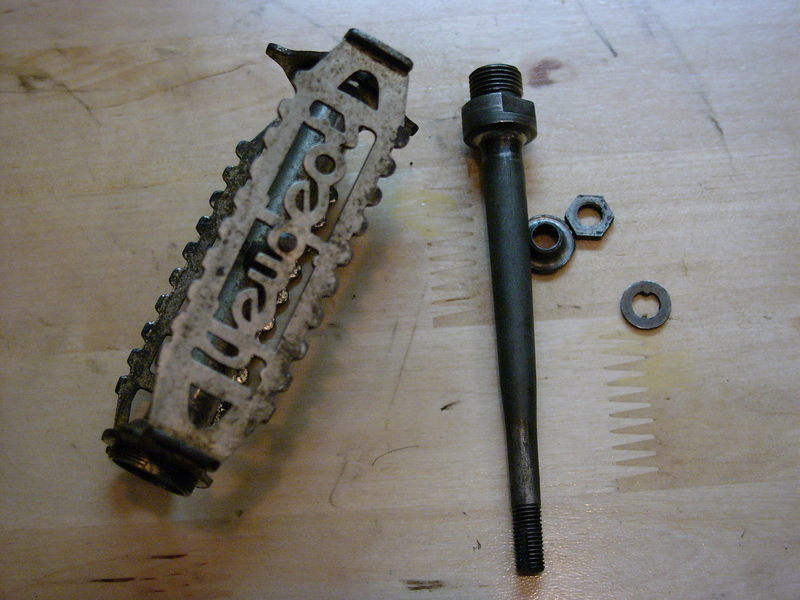 When I disassembled the pedals, I found their spindles to be in good order, as compared to their 1970’s counterparts. 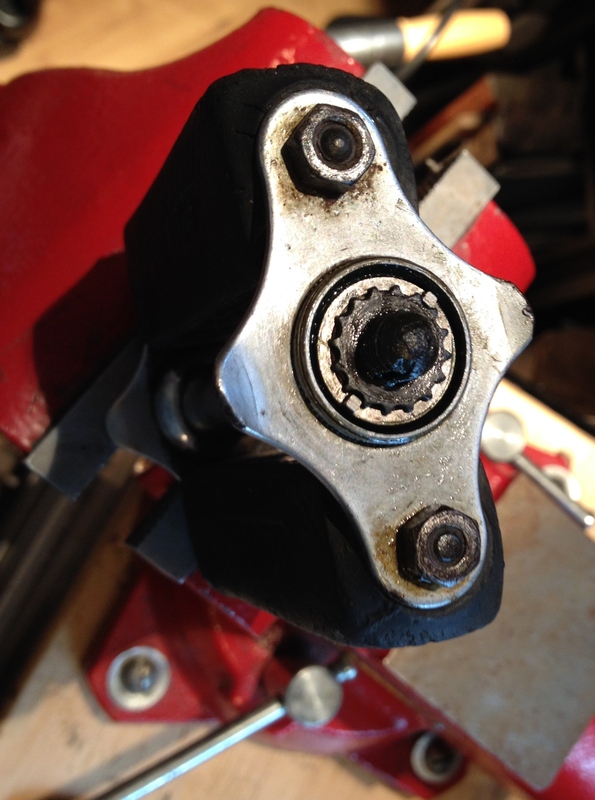 But, the threads on one of the spindles failed due to a bad spindle design, which was corrected later by the manufacturer. Even so, these pedals are quite comfortable when used with toe clips (which is how they are designed). The foot bed is large and flat, and the toe clip keeps one’s shoe in place. There are a number of vintage platform pedals that are very comfortable, such as these 1940’s Tank pedals pictured above. Modern day counterparts include MKS as well as other cage pedal designs. However, I have found my Shimano Saint pedals to be far more comfortable than a typical cage pedal, and so have installed Shimano Saints on my regular commuting bicycles. The large platform and adjustable pins really make for a comfortable and safe ride. This entry was posted in Vintage Bicycle Pedal and tagged Aluvac, Marcel Berthet, Shimano saint, Vintage Raleigh by Nola Wilken. Bookmark the permalink. I like the Peugeot pedals. I think modern pedals perform better than their grandparents, but there’s something to be said for combining decoration and function. Those pedals are nice, and so are the Aluvac pedals on the 1947 Peugeot.